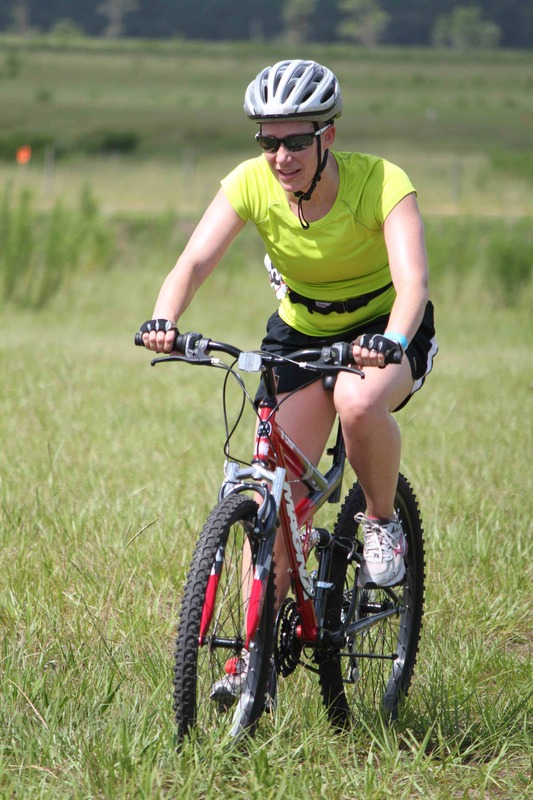 CLERMONT – Maybe it was the kayak segment, the 90-degree heat, the brutal six-mile bike slog through a rolling cow pasture or a 5K run with just enough obstacles. Whatever the reason, this morning’s debut of the “YAKathon,” a tough kayak-mountain bike-run through the Roper Ranch here just west of Orlando, may have found the happy medium between obstacle racing and triathlon. Jonny Simpkins and Wendy Carson, who launched their Rock On Adventures company last year with the popular Highlander Adventure Run, have pledged to come up with events that depart from the obstacle run bandwagon that everyone seems intent on jumping onto. So while they’re bringing back The Highlander for a third edition on Sept. 22, moving to the Roper Ranch from last year’s Bartow venue, they’re also coming up with things like the YAKathon, which was unlike anything we’ve attempted. It began within a half-mile run to the water, where athletes either jumped in one of a flotilla of rental kayaks provided or into one of their own they staged earlier in the morning. The run was just enough to separate the pack – there were six waves of 50, one each half hour beginning at 8 a.m. – to avoid a bottleneck at the launch. I raced with two of my kilt-clad Running Commando teammates and didn’t think I’d be the only stand-up paddleboarder in the race. 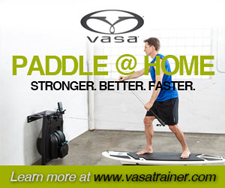 It was an interesting experiment to see how a SUP rider fared against a lake full of kayakers over a one-mile loop. The thinking is that kayakers have an advantage with a two-sided paddle; sort of like Darth Maul and his double-bladed light saber matched up against Obi Wan Kenobi. But I maintained my position in the water and even had a few people suggest I had an advantage, even though my movement was restricted because – and I’m embarrassed to say this – I was wearing a (required) life jacket on a board for the first time in nearly two years of paddling. 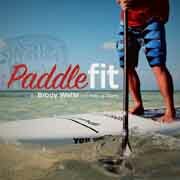 Personal flotation devices are a sore subject among paddleboarders, who see SUP as more like surfing. In reality, the Coast Guard is right to declare paddleboards vessels and require life jackets and I soon will be purchasing one of the inflatable waist PFDs that will save my life without restricting motion. It helped that I was paddling my fast YOLO Predator race board, which I could yank out of the water and haul back to transition more quickly than the kayakers could lift their boats. On the other hand, they paddled in shoes and I lost time taking my shoes off in transition before getting on the board and putting them back on before running a half-mile back to the bikes. Perhaps Vibram Five Fingers would have been the happy medium, though I hate to think what it would have been like pedaling 6.2 miles in them. Simpkins and his crew mowed a path through the pastures and I’ve never been on a better marked course in any off-road race, with hundreds of red directional arrows. But navigating a bike over rolling terrain consisting mostly of grass over sand was challenging. The closest thing to a hard surface was an occasional brief grassy strip of packed-down dirt. In theory, the YAKathon was comparable to a sprint triathlon, though I’ve never felt more sluggish getting off a bike and heading out on a 5K run. Simpkins took us out on a reverse version of the course he laid out for the Monster Bash Dash 5K, the zombie-themed run he debuted in May and will bring back Oct. 27. There were countless minor obstacles – low-lying branches, fences, 3-4 foot walls, and a series of obstacles over the last 200 yards. I finished in 1:42:13, which is 30-35 minutes slower than a sprint triathlon time. I cramped up on the run, something that only happens in longer triathlons. There were plenty of water stops, but I didn’t take my pre-race hydration seriously enough. Lesson learned. The YAKathon is a serious challenge, one non-swimmers and triathletes will enjoy. We’re pumped to see what Simpkins and Carson come up with for The Highlander in September. By hosting all of their events in one sprawling venue convenient to Tampa and Orlando, they can overlap courses and obstacles, giving them something of a homefield advantage. Rock On Adventures was among the first to give out the soft, fitted Tultex T-shirts, and they delivered another a great shirt to go with a promising race.